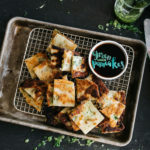 Not your typical pancakes – these guys are classic Chinese cuisine: multilayered flatbread liberally sprinkled with green onions. Crispy, savory, and oh so addictive. If I had to choose one herb to have magically appear in my fridge, everyday replenishing itself, it would be green onions. I love them so much that Mike came up with an acronym for them for me when I’m making handwritten notes in my notebook: FCGO. Before that, I was laboriously writing out, finely chopped green onions. He wanted to both make fun of me and streamline things so my hand wouldn’t get cramped, so he started throwing around “FCGO.” It’s supposed to be like my version of EVOO, heehee. I love how raw green onions pack an onion-y bite, but fresher. And I absolutely love how when they’re cooked they release an even MORE delicious mellow, mild, almost sweet onion taste. If you haven’t had green onion oil, you’re missing out because it is one of my all time favorite things, either on egg noodles or with rice. 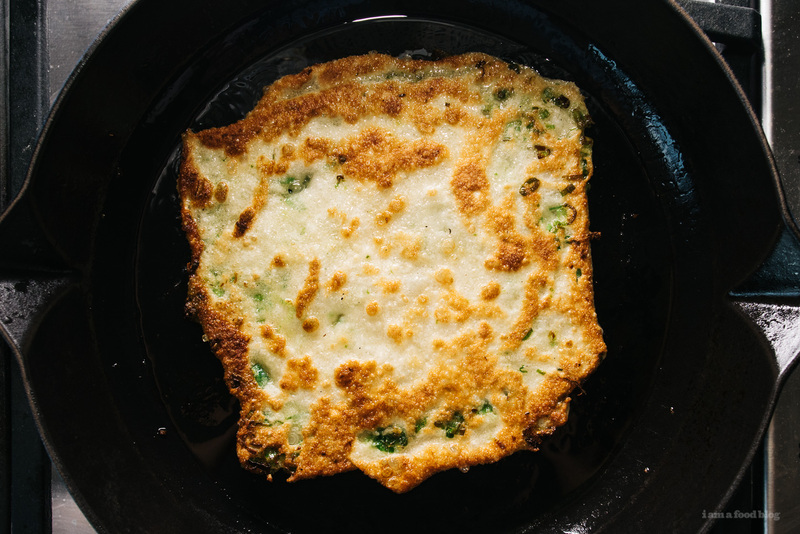 A close second to FCGO and green onion oil are green onion pancakes. I love them! They’re perfect on their own, hot and crispy out of the pan, but if you’re feeling decadent, rolling them around beef with hoisin or dipping them into kimchi stew is a pro move. I have a regular green onion pancake that I make: it’s a straight forward hot water and flour base, rolled out thin, brushed with oil and dotted with FCGO before rolled up jelly roll style and flattened. It’s fast and easy and it definitely hits the spot. But, the other day I felt like taking a bit of time to craft a truly excellent green onion pancake. So, I turned to a recipe I saw that promised the ultimate green onion pancake, I had to try it out. It’s a bit more involved, because I had to break out my stand-mixer, but it was worth the effort. The dough was soft and supple, flaking up beautifully when cooked. I think the extra step of blending up a green onion oil with a bit of baking soda was also genius – the baking soda helped the layers fluff up even more. Mike and I devoured these, dipped in a simple mix of sweet soy sauce and Chinese black vinegar. We took them out to our little deck (which is covered in fake grass) and had ourselves a little green onion pancake picnic. It was green onion heaven. In a stand-mixer, with a dough hook, mix together the flours and salt. With the machine running on low, slowly add the hot (almost boiling) water in a thin stream. Mix for one minute and then stream in the cold water and knead for one minute. Slowly stream in the oil and knead, for 5-10 minutes, or until the dough is shiny and elastic. The dough should pull away cleanly from the sides and when the dough hook is lifted, it will droop down slowly. Cover the bowl with plastic wrap and let rest for an hour. 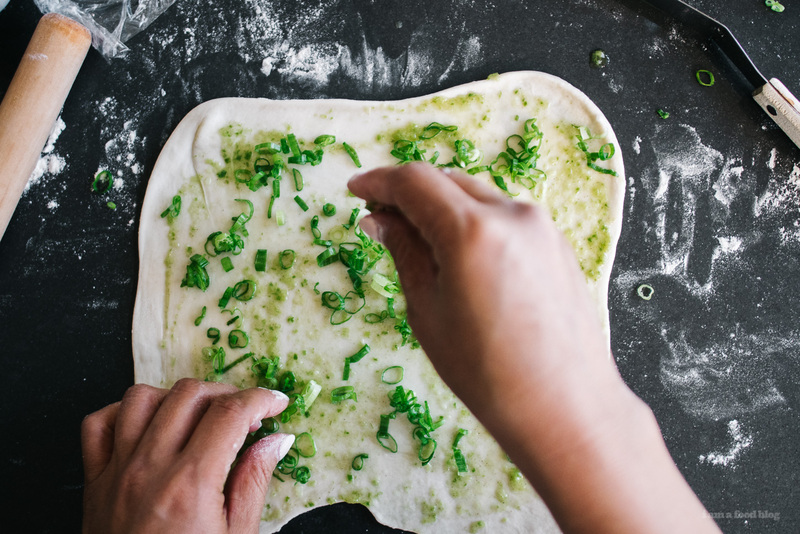 While the dough is resting, make the green onion oil. 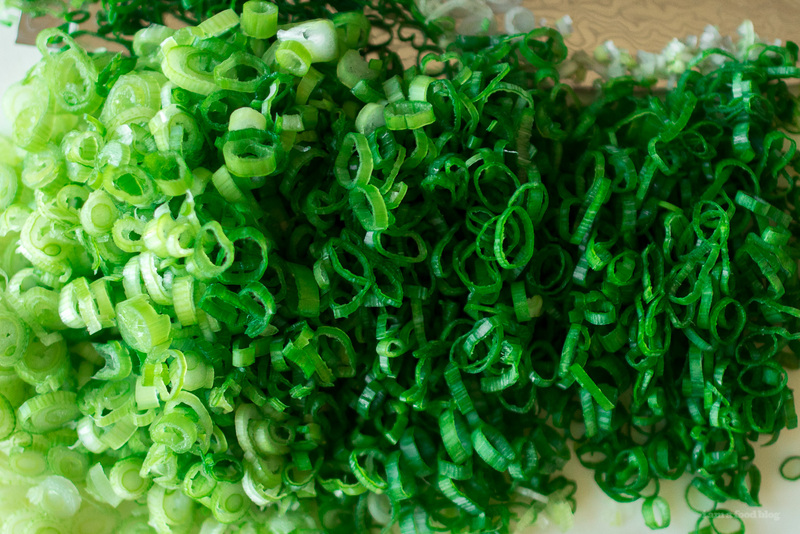 Blend the green onions, oil, salt, and white pepper until smooth. Move to a bowl and stir in the baking soda. Cover and refrigerate until needed. Divide the dough into 4 equal portions on a floured surface. 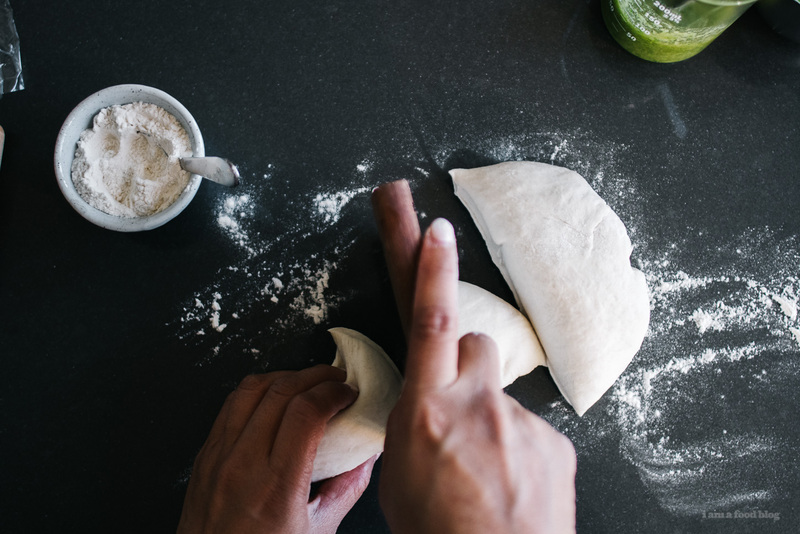 Working with one portion at a time (leave the other portions covered), roll out the dough until about 1/8″ thick. Thinly brush on some of the green onion oil and sprinkle with about 2 tablespoons of sliced green onions. Fold the dough in thirds, like a letter, rotate, and then fold into thirds again. Cover and let rest while you repeat with the remaining balls of dough. Once all of the balls of dough have filling, it’s time to roll them out. Lightly pierce each ball of dough with fork – this will help you roll out the pancakes. If you don’t poke holes in the dough, the air pockets will try to force themselves out explosively, so don’t skip out on this step. 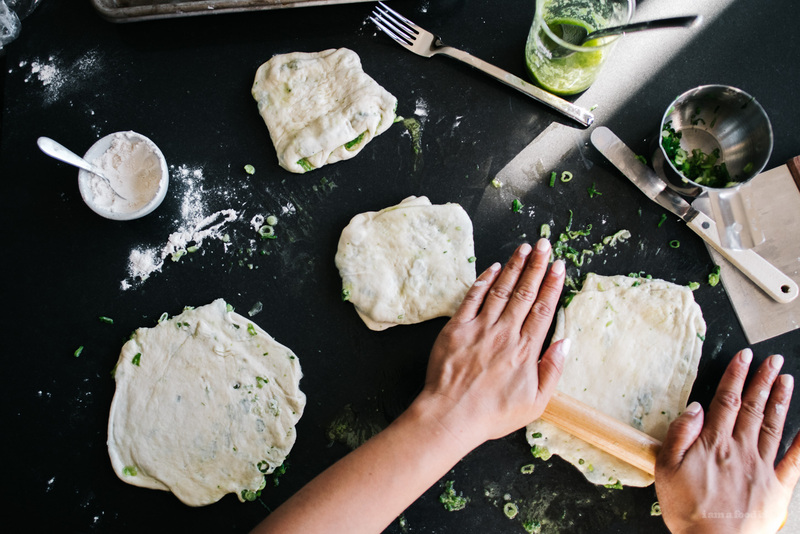 Carefully roll out the dough into a large circle, being sure not to crush too much – if you over roll, you’ll flatten out all of the flaky layers. I managed to roll out my pancakes to about 7-8 inches. Ideally the pancakes are rolled out to slightly thicker than 1/16″. Heat up a skillet over medium high heat. Add a tablespoon or so of oil and when shimmery and hot, carefully lift up the pancake and transfer it over to the skillet. Cook on medium-high until golden brown and puffy, flipping once. Remove from the pan, slice and enjoy! Yuuum! Green onion is such an essential taste in Chinese cuisine! Beautiful, as usual. And btw, your blog is so cute with the colors of your hair. You guys are really awesome. This looks delicious! Haven’t had green onion pancakes in such a long time…yet alone make them! 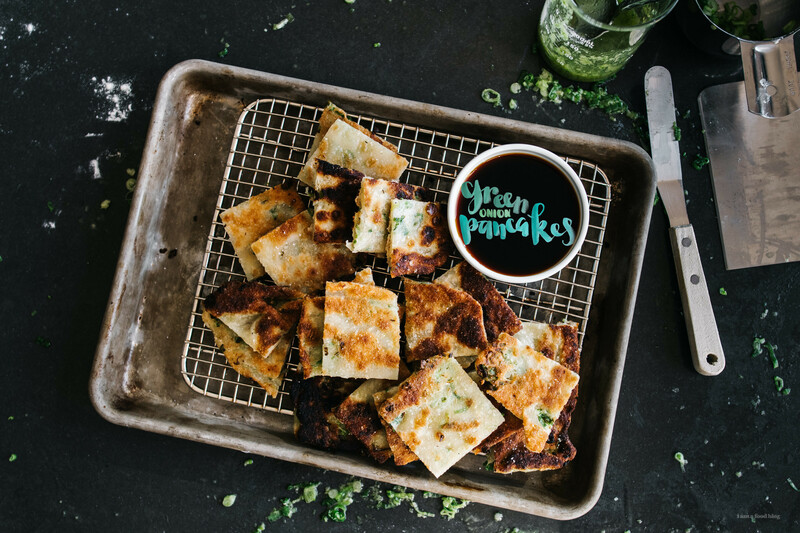 Onion pancakes are one of my all-time favorite snacks! I love that they don’t require yeast (my culinary nemesis) to be chewy and fluffy. Yum! 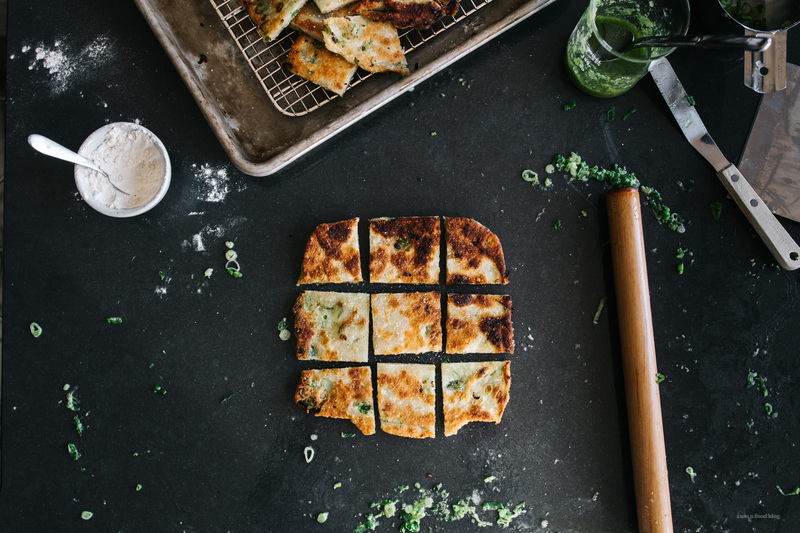 Green onion pancakes! My friend would make these for my roommates and I in college as a hangover cure. ;D They were the absolute best. Hi , I am an aspiring food blogger , exploring at the moment , but I must say your blog is amazing . Love the pictures and style of writing . wowww hoping to be like u guys some day .